Eyeing the growing influence of online platforms, and the risk they’ll abuse their dominant positions, the European Commission is considering whether new measures are needed to limit firms that could include Google and Facebook, or Apple’s app store. Commissioner for Digital Economy and Society Günter Oettinger is expected to announce on 24 September the launch of a public consultation on online platforms. An EU source said that Oettinger would probably speak from Silicon Valley, although the confirmation is still pending. The reason behind that is to clarify to affected companies the issues at stake in the consultation and how EU authorities can cooperate with US-based firms to address them. Speaking at a conference organised by the think tank Bruegel, Commission Vice-President for the Digital Single Market Andrus Ansip explained yesterday (7 September) that “concerns from many quarters” include the use of data gathered by firms, as well as the companies’ market strength and bargaining power. The Commission also intends to look into access and openness, as platforms should be “instruments of opportunity” for other industries, Ansip stressed. Ansip has invited 14 commissioners involved in the digital single market strategy to further discuss the details of the consultation today (8 September), including the scope and the upcoming announcement of the launch. The Commission thinks online platforms have become very influential, and almost all areas of the economy will depend on them in the near future. The public consultation, set to conclude next spring, will examine whether new measures are needed and what impact they might have on incentives to innovate and deliver new services. “We will approach this exercise carefully, seriously and openly,” Ansip told the audience. The Commission’s consultation on platforms will also include questions on the free flow of data and on cloud computing. Ansip insisted that getting rid of data localisation, constraints that keep data stored exclusively within member states’ national borders, is central to the Commission’s plans to churn out major profits for European technology companies and other businesses that might reap financial rewards from drawing on consumer data. “Data localisation is not the solution. 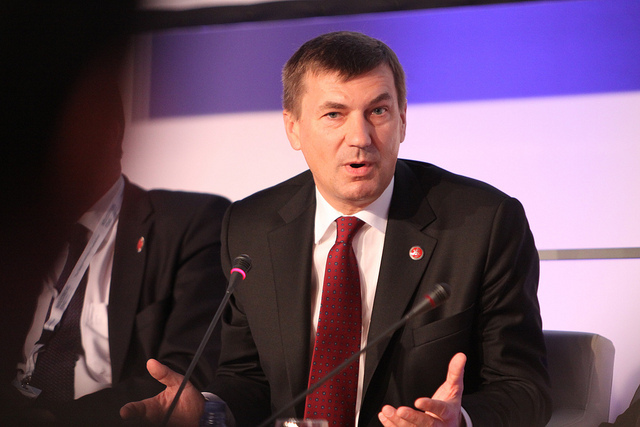 We have to provide an environment where there is a real free flow of data,” Ansip said. The Commission has so far been tightlipped about its plans on data flows. During a visit to Washington in May, Ansip said the free flow of data within the EU would also benefit countries outside Europe. “We all know not only in the European Union, but around the world, there are many governments, many parliaments, who are thinking about protectionism, how to keep data collected in the territory of a country, but it is crystal clear for me that the free flow of data is really needed for our economy and for democracy,” Ansip told an audience at Washington think tank the Brookings Institute. An EU law that eases or even mandates the free flow of data between member states will be controversial with some European countries that already have laws in place to keep certain kinds of data firmly in domestic storage centres. Germany, for example, recently issued guidelines that prohibit government agencies from using clouds to store sensitive data if the cloud company processes data outside the country. Germany’s draft data retention law, which has been held up for months, also requires companies to store consumers’ data in Germany. Constantin Gissler, head of office for German tech industry association Bitkom, said the Commission is right to look into free flows of data, but warned that the issue is complex. “Restrictions may be justified in some cases but not in others depending on the type of data. For example, few would question localisation requirements for sensitive government data as was recently stipulated in German public procurement guidelines,” Gissler said. “Still, any such rules need to be proportionate and the line needs to be carefully drawn in order not to stifle competition,” he added. An official from an EU member state with knowledge of data regulations told EURACTIV some companies would oppose laws mandating free flows of data if that means storage and processing can take place in European countries with lax privacy rules. “In the future, if we have equal data protection requirements in each EU country, then we’d just have the same rules everywhere,” the official said, noting the ongoing negotiations over the data protection regulation. Ansip also spoke out on another controversial consultation set to launch at the end of this week. The Commission is getting ready to send out questionnaires in the coming days as part of its public consultation on telecoms rules, which will include radio spectrum regulations. Member states have repeatedly balked at past EU attempts to reign in oversight over radio spectrum. Auctions that deal out spectrum to telecoms providers have generously padded some member states’ pockets with big cash returns. But the Commission put its foot down and has announced proposals for next year on telecoms and spectrum auctions as part of its digital single market plans. Member states will continue to administer the lucrative auctions, but the Commission signalled that it wants common rules to apply for spectrum sales across Europe. The European Commission presented its plans for the digital single market in May 2015 and announced that it would make concrete proposals on 16 initiatives in 2015 and 2016. The Commission also announced that it would launch an inquiry into online 'platforms', widely perceived to be a move to target large US-based tech companies. Week of 8 Sept. 2015: European Commission launches public consultation on telecoms framework, broadband and radio spectrum. Week of 21 Sept. 2015: Commission launches public consultation on platforms, free flows of data and clouds.